Indicator for disconnected resource assets? One thing I’m encountering on complex projects (especially when working with multiple JS or JSON files in the resource library) is sometimes I lose track if all my external files are still being used in a given Hype project. This occurs a lot when I’ve got tunnel vision and I’m testing code at 4am. 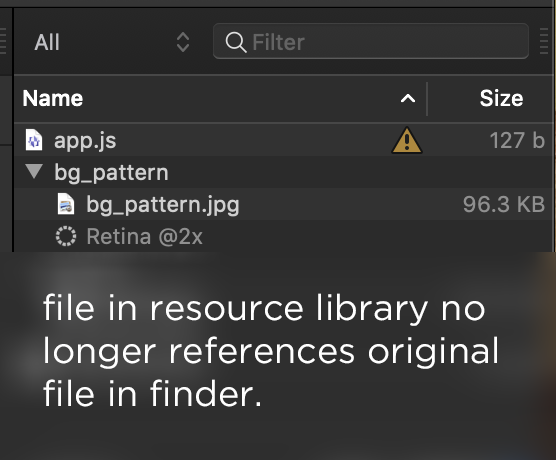 It might help to have a simple icon or indicator showing if a file is no longer being referenced from the original file path. This is just a nice-to-have, and there’s a very real chance that no one else has this problem and that I just need to be better organized. Thanks for the mockup! I’ve added this onto the issue in our tracker to address it.